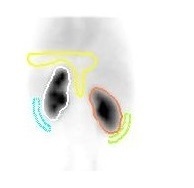 These examinations are in particular important in order to detect the function of the kidneys, e.g. in cirrhotic kidneys, recurring kidney inflammation and mechanical transport disturbances of the urine (outflow obstructions). In functionally relevant outflow delays surgical treatment is usually necessary.